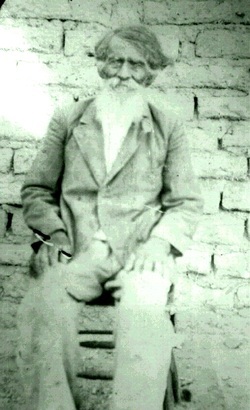 Gabriel Gallegos was born in February 1860 in Mexico, the son of Casimiro Gallegos and Dorotea Nunez. He immigrated to the United States in 1880. His future wife, Gregoria Franco, daughter of Mariano Franco and Bartola Baeza, was born in Julimes, Mexico in 1867. She immigrated to the United States in 1882. It is not known where they lived or met, but they returned to Mexico for their wedding in Jesus Nazareno Temple, Ojinaga on August 26, 1884. In 1900, the couple and six children were living in Fort Stockton, where Gabriel was employed as a farmer. By April 1902 the family had moved to the Terlingua area, where Gabriel purchased Section 16 of Block 17, a tract of approximately 640 acres along Terlingua Creek. He farmed about 15 acres of this land, diverting water from nearby arroyos to irrigate his crops. 1. Daughter Facunda Gallegos was born in Sep 1889 in Texas. In 1900 she was living with her parents in Fort Stockton, Texas. On May 3, 1908 she was the godmother of Maria Leyva (a), baptized in Terlingua. Facunda married Bernardo Martinez Luitt April 15, 1915 in San Angelo. They were married by Justice of the Peace F.A. Branch. B. Daughter Monsimonia “Trinidad” Luitt was born in Benjamin, Texas August 22, 1921. She married Carlos Chavez January 13, 1941 in Alpine and they had three children See http://www.lifebeforetheruins.com/encarnacion-chavez.html for details and for more information on the Chavez family. a. Son Federico Luitt Alvarado was born June 16, 1962 in Seminole. b. Daughter Debra Ann Luitt Alvarado was born November 19, 1963 in Seminole and died there June 11, 1965.
c. Son Cecilio Luitt Alvarado was born May 5, 1965 in Seminole. d. Son Michael Luitt Alvarado was born July 30, 1968 in Denver City, Texas. D. Daughter Mercedes Luitt was born October 3, 1927 in Bronte, Texas. She was baptized in St. Joseph’s Church, Rowena, Texas by Rev. Richard Altenbaugh. Mercedes married Jose Manuel “Joe M.” Carrasco and they had six children. See http://www.lifebeforetheruins.com/alejandro-luna.html for details and additional family information on Joe Carrasco. 2. Son Simon Gallegos was born in Texas in 1890. In 1900 he was living with his parents in Fort Stockton, Texas. In August 1916 he was employed briefly by the Study Butte Mining Co., working six shifts in the mine at $1.25 per shift. He died on 29 January 1919 in Leon Valley, Pecos Co. of Spanish Influenza and is buried in the Catholic Cemetery in Fort Stockton. A. Son Marcelino Gonzales was born April 26, 1912, probably in Terlingua. From at least 1934 to 1938 he worked as a miner in the Terlingua area. He died April 27, 1938 in Alpine of pulmonary tuberculosis and is buried in Alpine. B. Son Gabriel Gonzales was born in Terlingua October 26, 1916. He was baptized in Chisos January 18, 1917 by Father Antonio Alonso. His godparents were Leonides Hernandez and Valentina Gallegos. A. Daughter Guadalupe Orozco was born circa 1920 in Texas. A. Son Gabriel Saiz was born in 1924. He died February 28, 1924 in Loving, New Mexico and is buried there. B. Daughter Concepcion Felipa Saiz was born in 1934. She died in Carlsbad, New Mexico on June 2. 1934. C. Daughter Carolina Saiz was born in 1936. She died June 9. 1938 in Carlsbad, New Mexico. 7. Daughter Fidencia Gallegos was born November 16, 1902, in Terlingua de Abajo was baptized there May 17, 1903 by Father Brocardus. Her godparents were Basilio Fuentes and Francisca Algarte. She married Jose Luna December 17, 1921 in Terlingua de Abajo. The ceremony was performed by Father Max Weyert from St. Agnes Catholic Church in Terlingua. Jose was the son of Alejandro Luna and Antonia Lujan. Fidencia and Jose had two children. Fidencia died on April 4. 1933 in Alpine of tuberculosis and is buried in Alpine. (a) Daughter of Sixto Leyva and Adelaida Talamantes. 1900 Pecos Co. census records. 1910, 1920 and 1930 Brewster County census records. Brewster and Pecos Co. Texas and Eddy Co. New Mexico death records. Family history research by family members. Records from St. Agnes Catholic Church in Terlingua, copies on microfilm held by the Latter Day Saints Church.